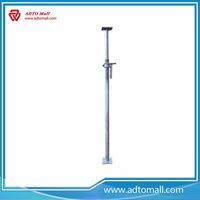 Acrow prop or BS prop is a piece of construction equipment. 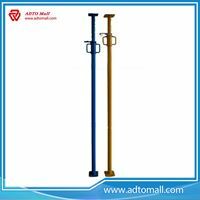 It is a telescopic tubular steel prop, used as a temporary support. 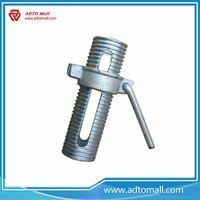 A jackscrew is similar but not as long and not telescopic. Acrow props are adjustable for height in two ways: a loose pin through a series of holes in the inner tube gives a wide range of coarse adjustment and a large diameter screw thread formed on the outside of the tube itself provides a fine adjustment over a short range. The screw thread also allows the props to be tightened when already in place, to adjust the load that each one bears. 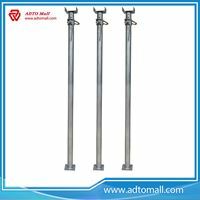 5. size 4 from 10.5 feet (3.2 m) to 16 feet (4.9 m). The safe load for a given prop varies according to the distance between its ends and the eccentricity of the load relative to the longitudinal axis of the prop. 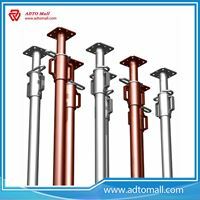 Acrow props are mostly used for shoring: temporary supports during building repair or alteration work, rather than scaffolding: access platforms for workers. A typical use is to support an existing horizontal beam when its original masonry supports are removed or repaired. 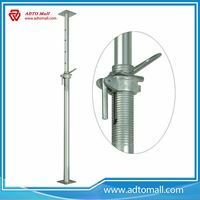 When masonry itself is to be supported, holes are first knocked through the brickwork and a strong 'needle' or 'strongboy' is placed through the hole. A pair of Acrow props are then used, one under each end. Existing windows or doorways may be supported directly, or via needles. The base and top plate of Acrow props are quite small, so they are suitable for supporting a vertical load but are at risk of toppling if there is any sideways force. In such cases, props should be strutted or 'laced' with scaffolding poles. A recent improvement to Acrow props is to shape this baseplate with notches, allowing pallet loads of horizontal props to be stacked neatly, rather than randomly piled. Although the original Acrow prop was only intended for vertical support, the range has since been extended. 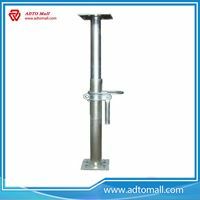 Shoring 'push and pull' props with swivelling footplates are available and are used to support concrete formwork. 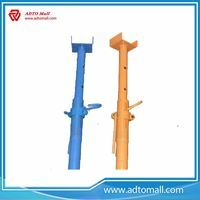 Horizontal strutting props are used for shoring trenchwork. These are similar, but have a 'claw' form to their baseplates.